In case of inclement weather (rain, strong wind) we simply contact you to cancel or re-schedule your booking. We send full refunds to our customers for booking cancellations made 24 hours before planned departure. Is there enough wine on the boat? Can I buy wine to go? Yes, and yes. The 5 samples of wine per person equals to 350ml / 12 oz + We can chill couple extra bottles if you let us know in advance. Definitely, ask us for a wine list and we will be happy to pack one bottle or a full box for you. Is there any food? Can I bring some? We just provide a bit of white bread that we pick up on the way in local bakery. It is there just to clear your palate and to slow down alcohol absorption. Feel free to bring your own food (such as charcuterie and cheese), especially if you are on a private cruise – keep in mind there is limited, or no space on the wine table. Do you play some music on the boat? Can you play our selection? Yes, the boat is equipped with bluetooth music system enabling us to play background music. We try to tune the music selection and volume according to the situation. If you are on a private cruise, let us know your music preference. How can I pay for the cruise? Which currencies do you accept? You can pay with your debit/credit card on-line during the booking process, or in cash directly on the boat. We accept CZK, EUR and USD. 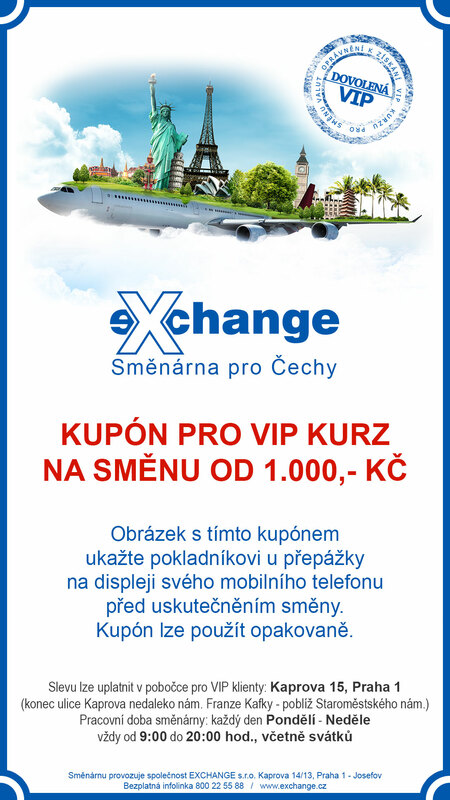 Fair money exchange is here + if you show this coupon to the teller, you can get VIP rates. We would like to book a private (or semi-private) cruise with you on a certain time/date which is not in your booking calendar. What should I do? Send us an e-mail with the requested time frame and a number of guests! Can you recommend us a nearby restaurant?